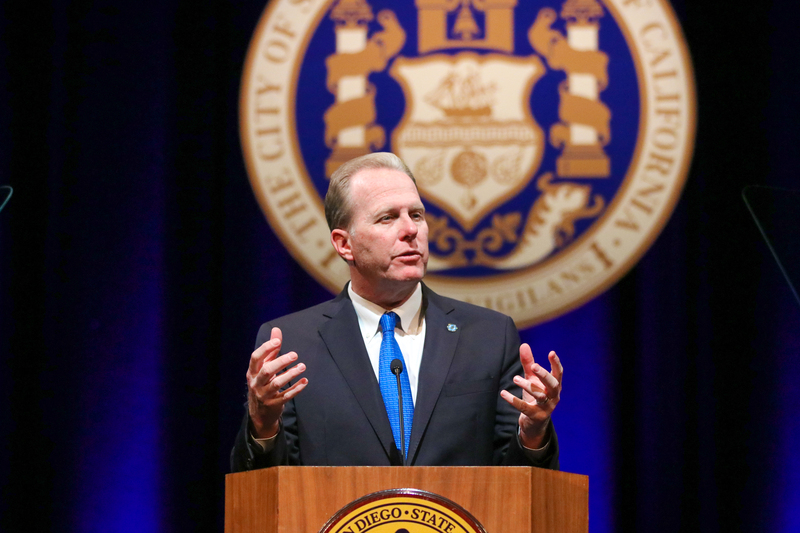 San Diego – Delivering his 2019 State of the City address, Mayor Kevin L. Faulconer today called on San Diego to say “Yes” to new approaches to tackle the city’s biggest challenges, from homelessness to housing to climate change. Mayor Faulconer outlined new plans for removing the anti-housing bias that stops new housing; establishing services that reduce homelessness throughout the city; addressing the region’s mental health crisis; continuing to invest in neighborhood infrastructure and programs; and creating a community choice energy program to provide green power to the entire region. The Mayor began the evening by stressing the importance of putting political divisiveness aside and working as one city. The Mayor announced he will commission a citywide review to determine whether the companies that do business with the City reflect San Diego’s diverse communities. The disparity study will show where the City needs to focus its efforts to ensure that every qualified business, including women- and minority-owned businesses, has equal opportunity to bid on and win a City contract. Last year, the Mayor grew the “Clean SD” initiative to go beyond litter removal in neighborhood “hot spots” and expanded cleanups to more public spaces and natural environments. Crews have removed more than 2,700 tons of trash from the San Diego River and Chollas Creek as well as canyons, streets and sidewalks across the city. This year the Mayor plans to add crews and extend hours of cleanup operations to take it to the next level. The City continues to make historic neighborhood investments under Mayor Faulconer, with over half-billion dollars for infrastructure projects in the Fiscal Year 2019 budget. New fire stations, parks and libraries are opening a record pace and, in October, road repair crews made good on the Mayor’s pledge to fix 1,000 miles of streets by hitting that mark nearly two years ahead of schedule. Mayor Faulconer is also investing in how San Diegans get around. A new Downtown Mobility Plan is underway to make it safer and easier for bicyclists and scooter riders to get from point A to point B. In addition, the City made significant safety improvements to its 15 most dangerous intersections and, thanks to federal grants, will soon begin work on nearly 300 more intersections. Community Choice Energy: Mayor Faulconer will introduce next month a resolution to create a regional joint-powers entity, separate from the City, to supply renewable power to residents and businesses, and push San Diego forward toward its goal of 100 percent renewable energy. The Mayor will invite the County and local cities to join. Pure Water San Diego: The City will break ground this spring on the largest infrastructure project in the City’s history – a water recycling program that delivers one-third of San Diego’s water supply by 2035. Connecting the Trolley to the Airport: The Mayor is working with a coalition of regional leaders to plan and design a regional transportation hub with the goal of connecting the trolley system to the San Diego International Airport.